Since the beginning of his professional law career, Attorney Francesco Grasso has personally handled a considerable multitude of cases pertaining to the widest variety of legal relations existing between banks and client/consumer or debtor. Such significant experience and daily study of the legal theory and jurisprudence in the field of business law, corporate, law, bankruptcy law and civil and civil trial law have strongly shaped the vocation of Attorney Grasso toward the field of private law in general. In 1990 Attorney Grasso started fully independently practicing the law activity in his own law office and at the same time expanding the area of professional activity toward other sectors of public law and specifically of administrative law pertaining to building industry and urban planning, safeguarding of the environment, immigration, citizenship, etc. and acquiring and achieving in that area remarkable goals. Passionately fond of international law since the university studies, in 1998 Attorney Grasso attended the course of EU law at the Assembly Hall of the Appeal Court of Palermo, thus obtaining the certificate of attendance to the course, followed by the in-depth study of the subject, still in its infancy, of the treatise of European administrative law subdivided in general and special part directed by Mario P. Chiti and Guido Greco by the publishing house Giuffrè 1997. 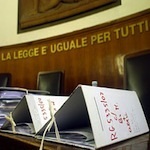 Today, based also on the profound changes made to the civil proceedings, Attorney Grasso is also a professionally qualified mediator, a qualification already obtained through a certificate of attendance to the training course, which allows exactly of practising the activity of mediation at appointed venues for the mandatory settlement of disputes required obligatorily by the law between private entities, and not pertaining to business or civil law, pursuant the Legislative Decree nr. 28/10. 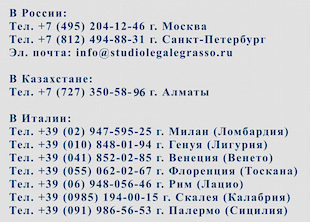 Currently Attorney Grasso practices also the activity of legal consultancy inside the most varied sectors for the safeguard the rights of the citizens of Russia, Ukraine, Belarus and other countries, personally handling legal matters pertaining to the issue or denial of Residency Permit to non-European citizens, or connected to the acquisition of Italian citizenship and still more generally to the problems connected to immigration to Italy or political asylum.